The Changing of the Guard is one of London’s most famous spectacles. While you’re watching you should definitely listen to the song the band is playing. Technically the Changing of the Guards happens at a few different locations around London but the most popular place to view the guards’ pomp and pageantry is at Buckingham Palace. It all starts at 11:30 AM. You can see the Changing of the Guard every day during the spring and summer or every other day during the fall and winter. You should get there about an hour early to secure a good viewing spot. This answer is a bit more complicated. 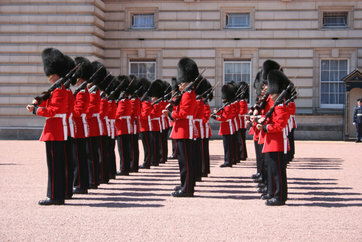 The Queen’s Guard has been around for over 250 years. Their purpose is to guard the sovereign and royal palaces. They guard the Tower of London too even though no people live there anymore, just the crown jewels. But they don’t just march and guard! All of the foot guards and cavalry you see are operational-duty soldiers and those guns they’re holding aren’t for show. They’re fully operational and loaded! First of all don’t miss it! The Changing of the Guard is one of London’s most famous spectacles. While you’re watching you should definitely listen to the song the band is playing. The guards have a sense of humor and have been known to play anything from ABBA’s greatest hits to “Happy Birthday” while they are marching to their post. You should also pay attention to which flag is being carried. If the flag has the Union Jack as its background, the Queen isn’t home but if the flag has a solid red background, that means she is! And we know it’s the touristy thing to do but try not to bother the guards too much. The Queen’s Guardsmen have become famous for their ability to remain stoic in spite of tourists’ pestering and photo ops but their patience isn’t unlimited. If you get carried away you may get yelled at, have a gun pointed at you or be detained by the police. Has this info piqued your interest in the Changing of the Guard? You can learn way more than this if you visit the Guard’s Museum! It’s across the street from St. James’s Park. It’s only 6 pounds to enter and you can find all kinds of information on the five regiments of foot guards and the two regiments of household cavalry that guard her majesty’s palaces. Join AESU next summer and see the Changing of the Guard for yourself along with Europe’s other treasures. If you have any questions or want help booking your trip, please contact AESU by calling 800-638-7640 or fill out the contact form found on our website. This entry was posted on Thursday, September 10th, 2015	at 4:27 pm	. You can follow any responses to this entry through the RSS 2.0	feed. Both comments and pings are currently closed.